Got to hang out with Cathi, a former West Hawaii Today writing intern, at Lulu’s. She has since gotten out of the newspaper business and gone where the pay is much more decent in PR. She gets to travel all over for a company that used to be based in Honolulu but has since been bought out and moved to the mainland. Cathi and I got to be good friends during her stay in Hawaii during the internship and when she moved back to Hawaii to live and work. She’s on the Big Island to attend a friend’s wedding. 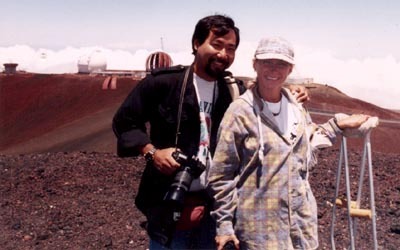 Me and Cathi on the top of Mauna Kea many years ago when she was an intern, you can see Keck II in the background being built, the twin scope to Keck I dome on the left. I think that’s the Subaru telescope on the left of the Keck Observatory under construction. Note that Cathi has a pair of crutches. She had broken her ankle while bike riding, or should I say bike crashing near the End of the World which is the endpoint of Alii Drive in Keauhou. Never go bike riding with a hangover and try to stop on loose gravel, that’ll get ya. This is only one or two weeks after the break (she said her foot was 90 degrees the wrong angle) and one of her last assignments so she insisted upon doing it. At one point our guide on the mountain for Keck, Andy Perala, looked at her and noticed that her lips were blue from the lack of oxygen just and she was about ready to drop, but she didn’t and recovered fine after resting a bit. I did have the shlep all of my gear along with all of her gear on the mountain.